One of the most effective and highly recommended cat and dog wormers are the range of Panacur wormers. Veterinarians across the UK have advised pet owners to use these products regularly every three months since it is often difficult to recognize the symptoms of intestinal worms. In the UK, there are at least eight different types of intestinal worms that can infect felines and roughly a dozen that infect canines. A single syringe contains enough Panacur to treat 9kg bodyweight of adult cat or dog. If it is used to treat kittens or puppies, then a smaller dose should be given every day for 3 days, and a single syringe will fully treat kittens or puppies to a total bodyweight of 6kg. (eg 6 kittens weighing 1kg each). For full dosing instructions, see the datasheet below. As such, de-worming your pet using Panacur paste or tablets to promote better animal health is a wise decision. If you keep horses, there is also Panacur Equine Paste. Dog wormers such as the aforementioned de-wormer paste are called "anthelmintic" which describes any product/substance that attacks and destroys parasitic worms. Another factor to consider whenever you are using Panacur Paste is that the product can also be administered to pregnant cats or dogs and will not harm a foetus. This product comes packaged in plastic syringes containing five grammes of the product. It needs to be dispensed as far back in your cat or dog's mouth as possible. Once your pet has finished its daily feeding, simply squeeze the paste from the dispensing syringe to the back of their tongues. You also need to administer another treatment of Panacur paste when natural parasitic re-infection occurs. We also advise pet owners to re-administer the treatment at intervals of six to eight weeks if you have recently acquired a cat or dog from an animal shelter or kennel. Animals from these establishments could easily be exposed to these intestinal parasites whilst being cared for there. Treatment should be repeated when natural reinfection with parasitic worms occurs. Routine treatment of adult animals with minimal exposure to infection is advisable 2 to 4 times per year. More frequent treatment at 6 to 8 weekly intervals is advisable for dogs in kennels and cats in catteries or on breeders' premises. Puppies and kittens should be treated at 2 weeks of age, 5 weeks of age and again before leaving the breeder's premises. Treatment may also be required at 8 and 12 weeks of age. Thereafter, frequency of treatment can be reduced unless the pups remain in kennels or cats in catteries or on breeders' premises where reinfection occurs more readily. Due to the recommended dosing regime, it is recommended that alternative formulations of fenbendazole are more appropriate. Wear impermeable rubber gloves while administering the product. Do not store above 25 °C. Keep syringe in outer carton. 5 g syringes and 10×5 g syringes. Panacur has been used extensively for the treatment of worm infestations in exotic animal species. For further information on suggested dose rates, please contact the veterinary adviser of the company. Below are some recent questions we've received regarding Panacur Paste for Dogs & Cats, including answers from our team. I can't fin the expiry date of the Panacur Paste for Dogs & Cats on your web. Would you please advise? Thank you. Thanks for your enquiry. The expiry date of our current stock is 02/20. You should give your pet the full number of graduations according to weight on the dosage and administration chart. For example you should give 12 graduations if your pet is between 5.1-6kg. If your pet is say 5.5kg you should still give 12 graduations. Can i give paracur in a enema? Panacur works on the worms higher up in the gut than you can reach with an enema. I doubt if it would be of any real benefit if you were to give it that way. If the puppies can keep any food or liquids down, then they should cope with Panacur added to that. Panacur is very gentle on the digestion and rarely causes any trouble that way. Of course if the puppies are vomiting anyway then they might lose the dose incidentally, but if that happens you can very safely repeat the dose as often as you need to, it is such a safe product. Hi , I have 4 tortoise, I have just aquired 2 of them, I want to worm them & they are all adults. The heaviest one is 900g & the lightest is 500g could you advice me on what to get plz. Many thanks. Using a standard dose rate of 100mg/kg bodyweight, your larger tortoise would require 0.48g of this product (= 90mg of fenbendazole). The smaller tortoise would require 0.27g (= 50mg of fenbendazole). There is a large amount of leeway on the dose of this product, so it is about half a gram for big tortoise and quarter of a gram for the small one. The syringe is calibrated in grams. You can add this to a small amount of favourite food (strawberry or cucumber often works well). I have an 8 week old puppy and he has been wormed by the breeder before collection. He is now due for worming again. The breeder used Panacur. If I buy a syringe and give a dose, how long will the remaining paste last once opened? I hope this helps if you have any further enquiries please do not hesitate to contact us. Is a graduation a cc or a half a cc? how much does a 13 lb 8 week old puppy need of the paste? The graduations on the syringe correspond to the weight of the puppy. For a puppy you give one graduation per kg bodyweight (about 2lbs) of puppy. So if your puppy weighs say 6 lbs, you give 3 graduations on the syringe. What does 1 syringe graduation mean?? The plunger on each syringe has a series of black lines on it and these are called the graduations. As you slowly depress the plunger, you can count how many graduations you have given. Each graduation provides enough Panacur to treat 0.5kg of Panacur (for adult dogs and cats) so a 4kg cat would require 8 graduations along the plunger. Only one size of syringe is manufactured for dogs and cats and it is intended for small dogs. If it helps, Panacur granules are generally easier to use on larger dogs, added to food. Can Panacur paste be mixed with food ? It's for a puppy who is not easy to give as directed but usually eats without tasting! Ideally Panacur syringe should be given by mouth when possible but if you mix it into a little food and he eats it all in one go, this should be acceptable. The product would naturally mix with food in the stomach so this won't cause a problem, the most important factor is ensuring that the entire dose is consumed in one meal. The are Panacur Granules available in sachets, intended to be mixed into food, so are likely to be a better option for you. If he is under 6 months of age, a 3 day course is recommended with these products, using a dose rate of 50mg fenbendazole/kg. If he is over 6 months old, a single treatment with the normal dose rate 100mg/kg is needed. The data sheets will contain full dosage information and our SQPs would be happy to advise if you have any queries. My dogs hates tablets, is there a good alternative? We have an 11 year-old Shihtzu male. We have de-wormed him regularly using Drontal tablets. These have become increasingly difficult and now impossible to administer - he is wise to all our tricks! We wondered if a liquid would be easier - a syringe with extension tube delivering to the back of the mouth should work. There are a number of liquid de-wormers offered. Can you recommend the best one. We would like to cover both tape and round worms. Your advice would be much appreciated. 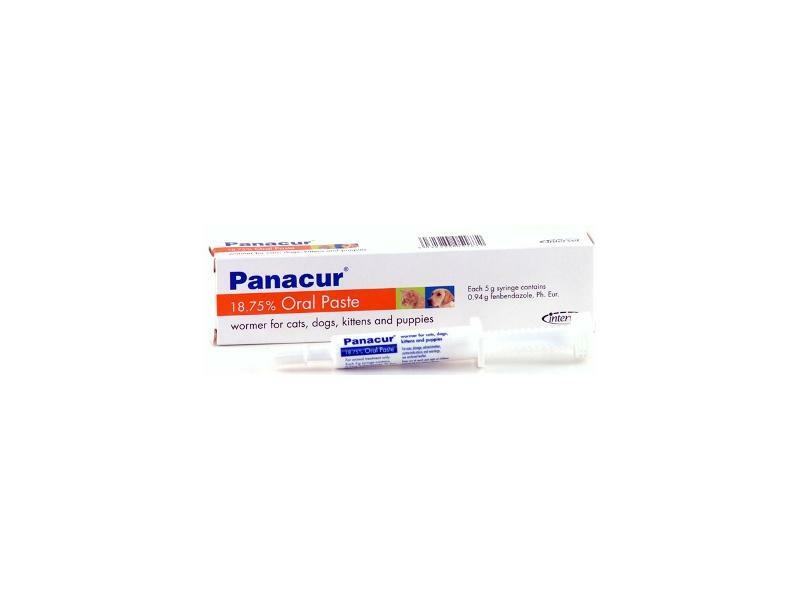 The best liquid wormer in my opinion is Panacur. It comes in liquid or paste formulations and is extremely safe and effective. The only draw-back is that it's potency against one type of tapeworm is poor. However these are rare unless there are lots of fleas around (the main intermediate host for this tapeworm). I would go for Panacur paste personally. It is also very mild on the dog itself, which is an advantage for puppies or older dogs.